Selling Your Arkansas Delta Real Estate! Buying, selling or extending a home is one of the most exciting things you'll ever do it's also one of the biggest financial commitments you'll make. More than ever before, property means big money - your money. It will pay for you to seek the best advice possible from professional experts who really know what they are talking about. While we want you to talk to us and let us give you detailed advice about selling your home, we provided the following info to help in the process for now. Buyers today are taking much longer to make up their minds, viewing an average of 19 properties before finally making a decision. And when they finally do put in an offer, it's usually well below the asking price. Here are 10 basic rules you should always do before putting your house on the market. They say you can only make one "first impression," and people usually form their first impression within 30 seconds. 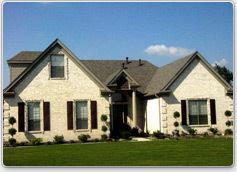 The front of your house is a good place to spend a little extra time and money. Plant flowers, trim bushes, weed, pick up leaves, repaint your front door, replace tarnished house numbers or a dented mailbox, get a brand-new neutral doormat, park your old car somewhere else. Your home must sparkle! Spring Clean your house from top to bottom before putting on the market. Having a weekly cleaning service while selling is probably a pretty good investment. Make sure your windows are clean inside and out too. Got a dripping tap or a cracked tile? These will send the wrong message to potential buyers. Getting all problems fixed before you put your house on the market is a smart idea. This may be the hardest rule of all! We love our clutter - it reflects our memories, hobbies, and values. But it doesn't sell homes! Clutter makes homes seem smaller and disorganized. (Have you ever noticed that the really expensive stores seem to have an expansive, clutter-free layout, while "cheap" stores are often a jumble of merchandise?) Even the ancient practice of Feng Shui has, as a central focus, the elimination of clutter. Neutral colors sell. It's a fact. Try to convey an image of quality and neutrality. Potential buyers walking through your home want to imagine themselves as the owners. If you use styles or colors they would never select, you've just turned them off. Stay high-quality, but neutral is safest. Remove objects that your potential buyers won't be able to identify with. For example, political and religious items may turn off whole groups of buyers, because they cannot "imagine" your home as their home. Buying a home is an emotional decision, and you want potential buyers to make an emotional connection with your home by being able to "see" themselves in it. Always keep your pets under control. Try confining them to a specific area. Although you may love your pets, they can be off-putting to other people, and smells can be offensive, so make sure there are no lingering odors in furniture or flooring, and if there is, get them cleaned before you sell. Buyers need to know what each room is for, so that they can decide where they will place their own items. Sell the lifestyle and you'll sell your house. Make sure you have adequate lighting in every room, use subtle mood lighting to create the right atmosphere in each room and check all your bulbs work. By using the right accessories, you can enhance your rooms and create a feeling of unity by using harmonious colors. Use mirrors to reflect light and space, and use plants and fresh flowers to bring life to rooms and add a natural fragrance. And here are some tips to help you prepare your home ready for sale. Loads of different floor coverings will make any area seem smaller. If you can't stretch to replacing all your flooring, close the doors on the other rooms until showing each room in turn. Bedrooms: Never underestimate the importance of bedrooms; it's the reason 60% of people move home. A bedroom adds more value than a study or storeroom, so make sure every bedroom has a bed. Concentrate on the Master Bedroom - its adult buyers who pay for the property, so impress them with new bedding and curtains. Look at the layout, buyers must be able to walk around the bed, or they will think the room is too small. Don't forget the storage, it's particularly important to female buyers. Built in MDF wardrobes can cost as little as $200 and by adding classy handles to give a stylish finish. Buyers aren't so bothered about children's rooms, but they must be clutter free and tidy, so bribe the children to keep their rooms immaculate. Loose the lodger - loads of people have them, but you're moving anyway, so give them their marching orders and tidy their room ready to move on. If you need to re-tile your bathroom or kitchen, why not tile over the existing tiles? By using the right adhesive, it will allow you to tile onto a flat surface and you don't have to worry about repairing the wall after the old tiles have been removed. Loads of rubbish to get rid of? Old toys, carpet, even furniture all needs to be disposed of, but by doing a deal with your neighbors, you can share a skip and share the price. Know all you can about your home. With the new homebuyer packs about to become a legal requirement, it would be a great idea to have a small pack ready for your viewers to check, full of information about when the wiring was changed, the boiler was last serviced and when the double glazing was done . If you live in an old house, know your history, buyers love it. If you have bulky furniture in a small room, remove it and either borrow, buy new or hire in some replacement furniture in a color to match your scheme, to give buyers a sense of space. Most properties have a good and bad side to them so don't show people the bad view or even comment on it, show them the views from the good side of your house. Not prepared to drop the asking price? Remember, buyers will only pay what they perceive your house to be worth. If your house is not presented at its best, then people will not buy. Period properties should show period features. Try replacing things that have been removed, you can use reproduction as long as it is good quality, and when re-opening fireplaces, you never know what you might find.